How to create "Whats New" template? Before you begin creating your experiences, you should design an outline of how you want to present the information to your users. The number of screens depends on how much information you have to update or educate your users. 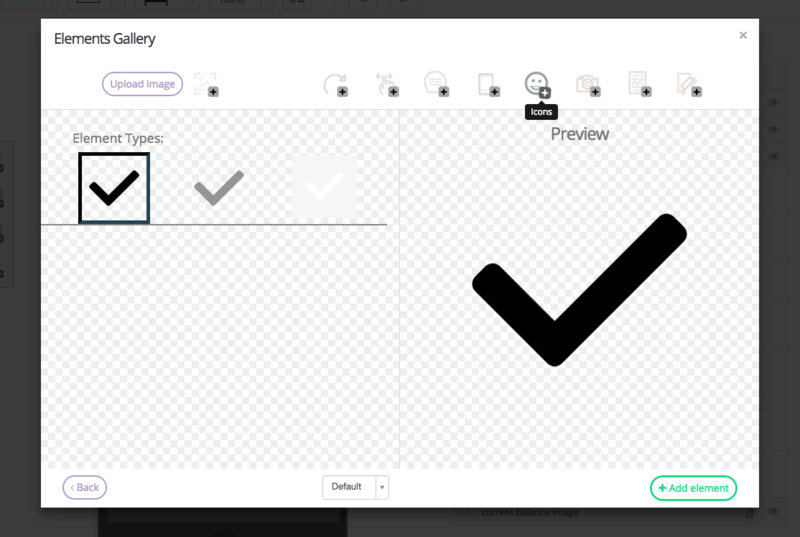 You will create this outline using our screen studio’s platform. Screen 1: All the images that we have chosen for this screen we have created. You should upload your images that best suit your experience. The first screen has very few elements. The very first element that is placed on the screen is the &apos;current balance image.&apos; This is the main background image that will be shown throughout the screens. Then, we placed a &apos;Shape Element&apos; , color overlay, on top of the image to create a fading effect. 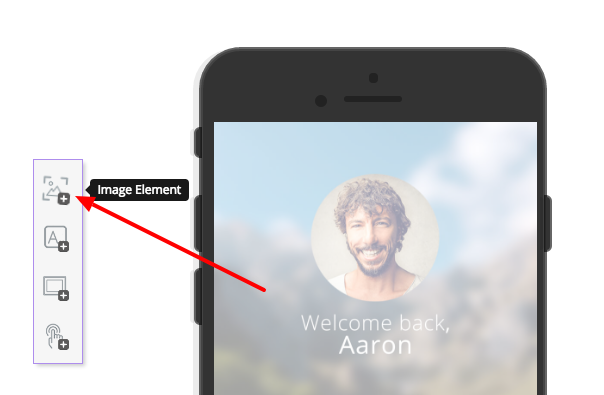 The &apos;Shape Element&apos; is located on the left side of the dashboard, underneath the &apos;Text Element&apos;. 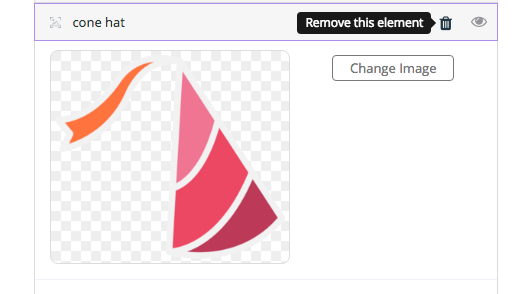 The default color for shape is a gradient, click on the Gradient and change to Color. We stretched the shape to cover the entire screen; then for the shape appearance, we chose the color &apos;white&apos;. In order to see the image behind, we decreased the opacity to 63. We clicked on the to hide the indicator (it should appear like this ), so the swipe does not distract from the overall image. 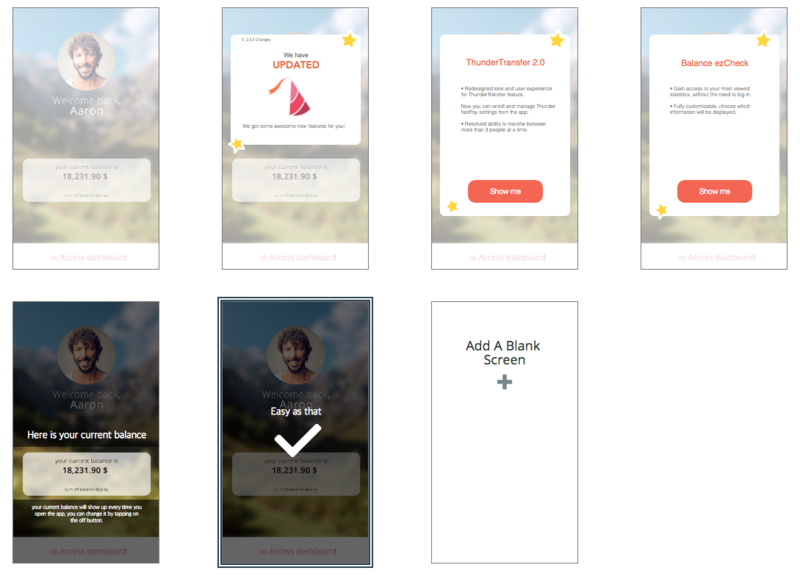 Screen 2: We wanted the second screen to look similar to the first one with the addition of more elements. We added another shape, white square, to be placed over the main picture and the overlay image. This new shape is white with a 100% opacity. We uploaded three new images: two star images, bigstar and smallstar, on either side of the square and cone hat. Review the previous screen on how to upload an image. 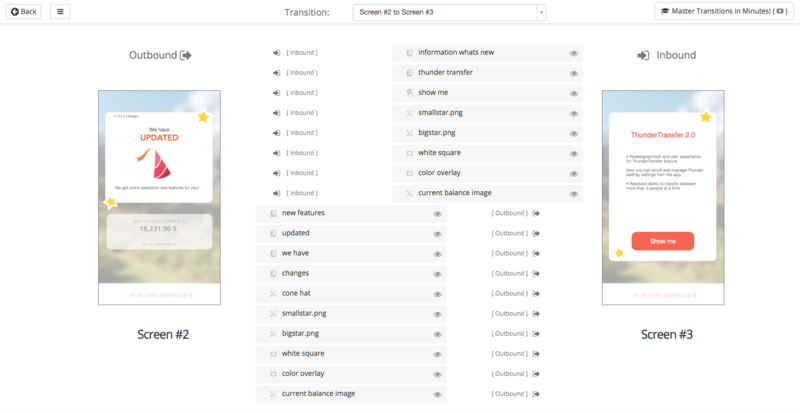 We added a four text elements: new features, updated, we have, and changes. To add text, click on the &apos;Text Element&apos; located on the left side of the dashboard underneath &apos;Image Element&apos;. Screen 3: The third screen has fairly all the same elements as the second screen. The difference in the third screen is the wording as well as the length of the new shape. 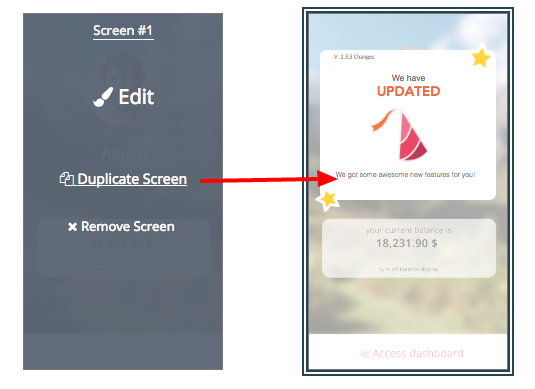 Review screen 2 if you need a refresher on how to duplicate a screen. We kept both the shape elements, but we stretched white square element. We removed the cone hate image. To remove any element, click on the trash can next to the name and then click Remove. We moved the placement of the two star images. Then, we removed the irrelevant texts and edited the ones that are relevant for the third screen. You can either delete all the text elements and add new text. Or you can just change the wording for each text element. 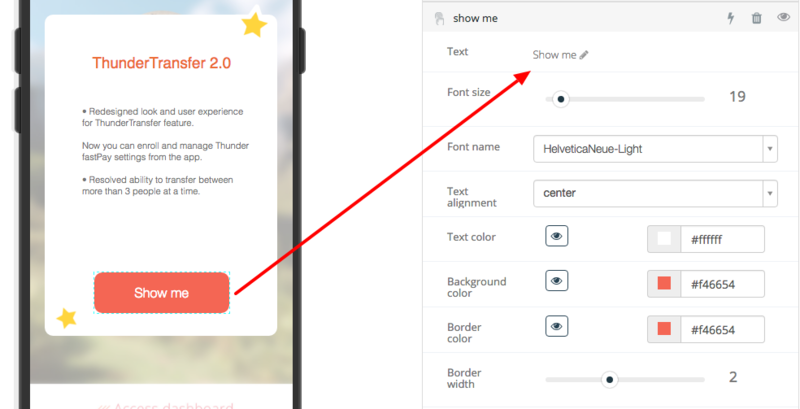 We also added a &apos;Call-To-Action Element &apos;, show me. We placed the button at the top bottom of the screen. We changed the background and border color to orange: #f46654. Screen 4: The fourth screen is a duplicate of the third screen. The only difference in this screen are the wording for the text elements. We also removed one text element. Review the previous screen on how to remove an element. Screen 5: On the fifth screen, we used the same image, current balance image. 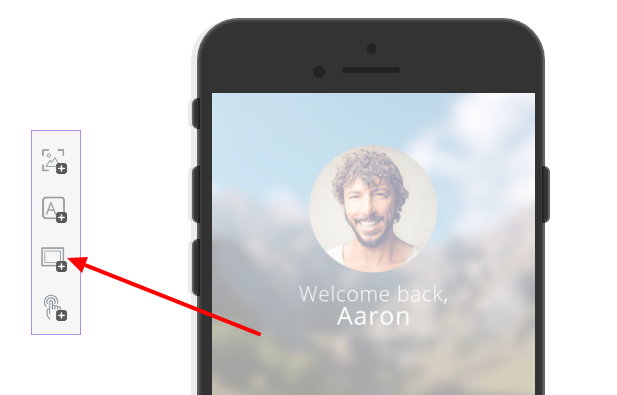 We removed the two white overlays, white square and color overlay and the Call-To-Action button, show me. We added two new shapes, and chose the color black for the overlay, top shape and bottom shape. 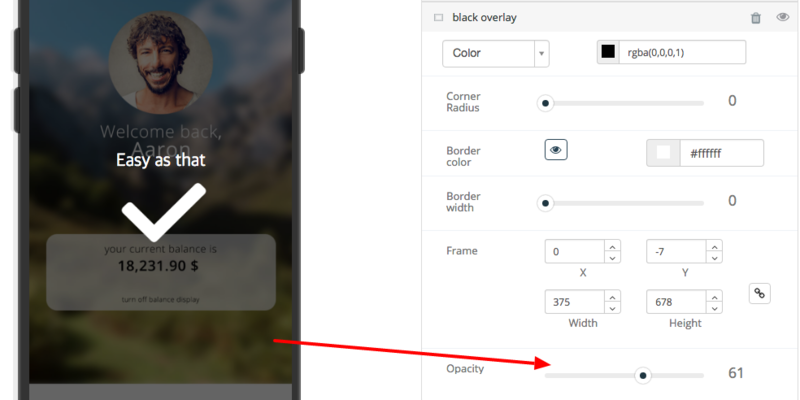 We wanted to be able to see the image behind these two elements so we set the opacity to 61. Note: We left a portion of the image, &apos;your current balance,&apos; with no element in order for that part to stand out from the rest of the image. 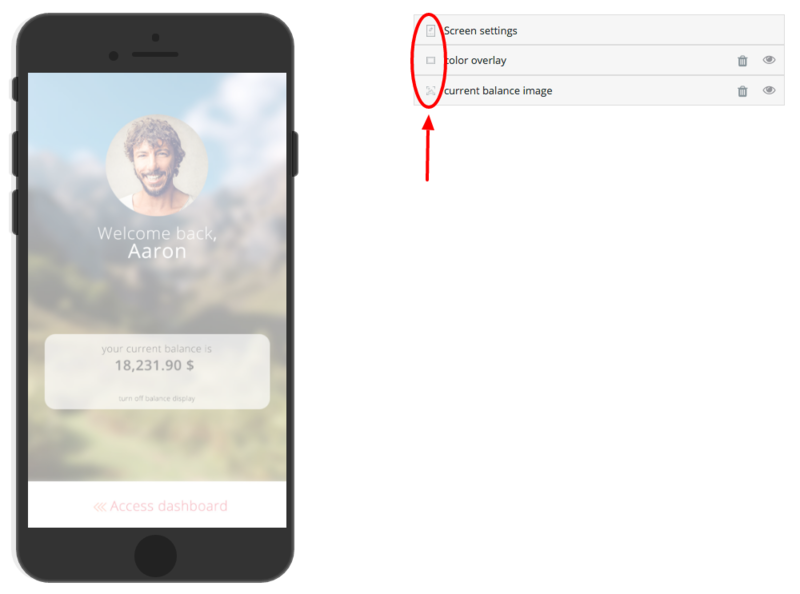 We also added two text elements to inform the user about the new part of the app that deals with the current balance. 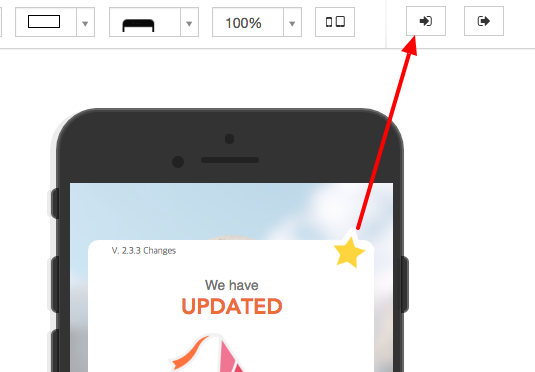 To add text, click on the &apos;Text Element&apos; located on the left side of the dashboard. Screen 6: In the final screen, we decided to have it be similar to the previous one. We duplicated the fifth screen and removed one of the shapes\black overlays and resized the second one to fit the full screen. We also relabelled the overlay, black overlay. The opacity is the same as the previous screen. We removed all the text elements except for one, easy as that. The last element that we added was an icon image of a check mark. 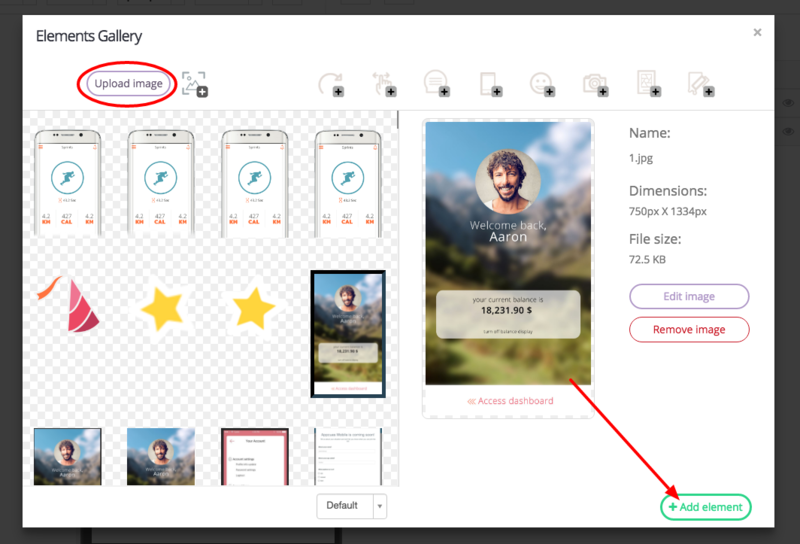 You can find this icon and many more icon images when you click on the &apos;Image Element&apos; , then on &apos;Icons &apos;. The default color for all the icons is black; in order to choose a different color just click on the image you want in your screen and then choose the color: black, white, or gray. Transitions: When you are satisfied with all your screens, begin to set the transitions, the flow between the screens. You will find these buttons, &apos;Transition Inbound&apos; and &apos;Transition Outbound&apos; , on the top of the screen. By clicking on one of these buttons, you will navigate to our transitions studio&apos;s platform. Lets begin by going over what is happening during this transition. The background is staying in the same position by switching from the other background image, while the text and the other elements are moving in from the screen. Lets begin by going over what is happening during this transition. The background is staying in the same position by switching from the other background image, while the text and the other elements are fading in/out and switching. Lets begin by going over what is happening during this transition. The background is staying in the same position by switching from the other background image, while the other elements are moving in and out with the screen. Lets begin by going over what is happening during this transition. The background is staying in the same position by switching from the other background image, while the other elements are moving in/out with the screen and moving out from the bottom of the screen. Note: Besides the transitions between screens, you have to set the &apos;Screen #1 Inbound&apos; and &apos;Screen #X Outbound&apos; (X=last screen), in our case &apos;Screen #6 Outbound&apos;. In most cases, you just want to make sure that the main background elements, will be set as &apos;Move In&apos; & &apos;Stays in position&apos; | &apos;Move Out&apos; & &apos;Stays in position&apos; accordingly, but in this specific case we set these as &apos;Move In&apos; & &apos;Move with screen&apos; | &apos;Move Out&apos; & &apos;Move with screen&apos;. When you are in &apos;Transition Inbound&apos; from screen two, you will see both screen 1 and screen 2. Here is where you will choose the flow from one screen to the next. Every element is labeled for you as either inbound or outbound.